The best way I can describe the Big Island (officially named “Hawaii”), is magical. While Oahu offered a unique city beat with surrounding micro rainforests, the Big Island’s diversity is literally unparalleled. The island consists of three active volcanoes and the ability to drive from sea level, to thousands of feet above, and back down again in minutes. The island is home to eight different climate zones, making it the most varied place in the world! Have I got your attention? Our experience at Black Sands Beach might have been made extra special by the fact that we arrived just after sunrise. The light was incredible, the weather was close to perfect, and to top it off we had the beach to ourselves. Unlike green sands beach (in my opinion) Black Sands Beach truly lives up to its name. The sand is midnight black and spreads far and wide, all the way to and beyond the waters edge. The image alone is striking, but the most exhilarating thing to me was the consistency of the sand, which felt more like large granules of sugar. The sand effortlessly pours through your fingers. The texture was so tantalizing I couldn’t help but dance in it (an experiment that led to the photo that you see on my homepage). The sand reminded me of some of the saunas we’ve been to at Spa World in Centreville, VA. As you in lay the sand it perfectly cradles your outline, providing a wonderful marriage of sink and support. I am no stranger to beaches, yet Black Sands Beach had me playing like a kid seeing snow for the first time. I’ve visited, explored, and lived near some of the highest rated beaches in the world, and for me Punalu’u Beach leaves an unforgettable impression which ranks it among the top of my list. Keylakekua Bay is a historical state park straddling land and sea, offering home to one of the absolute best snorkeling spots on the big island. The best way to see the reef is to go on a boat tour (we went with Fair-Wind Cruises). You can access the reef yourself, but you need to swim 1 mile from the beach access point to the reef in order to do so. And seeing as we did see a shark while snorkeling (a small one albeit) that distance would make me a little nervous. The cruises on the other hand anchor right next to the reef (plus there is a slide and diving board for extra fun!). When we anchored the boat, I almost couldn’t believe my eyes. The clarity of the water and vibrant colors of the reef had me in awe. You can see my enthralled expression in the video below! I was surprised how cool the water was considering it was early July, but since I am used to swimming in the Gulf of Mexico or Caribbean Sea I guess the enormous Pacific would provide a different experience. At times I even got goose bumps on my arms! Like Oahu, I was immediately welcomed by all kinds of diverse and colorful fish. This is another treat if you are used to snorkeling in the Caribbean; the Pacific provides a whole new family of fish, and you do not have to work very hard to find them. The depth varied between just a foot or so to about 20 feet. The shallow areas gave home to endless coral where the deeper areas had pockets of sand that you could dive down toward to take a look into the surrounding corals. Withstanding my chill, I could have snorkeled here for twice the time. Driving to Akaka falls was an interesting experience in itself. Most of the way was simply lush greens, but when we got close we entered the town of Akaka, which is super peculiar. It’s a tiny little town with an identity crisis – a mix of island and mountain culture. The stores were small, non air-conditioned shacks, and gave the sense that you had been transported back in time. But don’t let the old, rustic feel of the town fool you: we had some amazing food and coffee before hitting the falls. Parking is easy at Akaka Falls, and it is a very short trail walk to get to the main falls. Usually you can loop the trail and there is another smaller fall as well, but that area was blocked off when we were there. I wish you could get closer to Akaka Falls, but then again, if you could, I am not sure that you would be able to capture the magnitude: the falls are 422 feet high. The image is captivating: a narrow but voluminous river of water falling between the greenest rock and rainforest into a dark pool below. I am not able to review this fully as we did not make it to the summit. However, this is on our list for next time! We did make it to the visitor center, so I am including this in my top 5, because making it all the way to the top could only make it more exhilarating! This can be a dangerous journey for a couple of reasons. Like I mentioned earlier, you can drive thousands of feet up in minutes on the Big Island which is rare. The Visitor Center sits at 9,200 and the summit at 13,796. You can visit each safety as long as you follow necessary precautions. If you Scuba dive you cannot go to the summit for 24 hours. Additionally, anyone visiting the summit must stop at the visitor center for 30 minutes in order to let their body adjust to the altitude. While we originally thought we might go to the summit, inadequate planning and a bloody nose from snorkeling/underwater pressure (mixed with tons of flying) provided that the Visitor Center be the furthest that we go for this trip. The journey to the Visitor Center is an easy drive, with wide paved roads the whole way. It’s amazing to see how quickly the scenery changes. You’re in the mountains, driving into and above the clouds. Some of the landscape is still green, but much has changed to browns and grays, there is almost even a desert feel at the beginning of the drive. I had a bag of snacks at my feet and when we got to the Visitor Center, I pulled out a bag of chips which were now fully inflated. I thought it was hilarious, but also a good reminder that a lot was happening to our atmosphere in that short drive. The Visitor Center itself is very basic. There are bathrooms and another small astronomy complex which was still closed when we arrived. The view, however, is beautiful. You can see mountains all around and up toward the summit. When we returned home I read that there is a stargazing program offered here, which is also going on my list for next time! This was, without a doubt, the highlight of our Hawaii trip. We spent almost an entire day exploring what the park had to offer, and you could easily spend more! We started our journey with a quick stop at “Volcano House” the only lodging accommodations within the park. We were immediately drawn to the floor to ceiling, wall to wall glass window overlooking the Kilauea caldera. 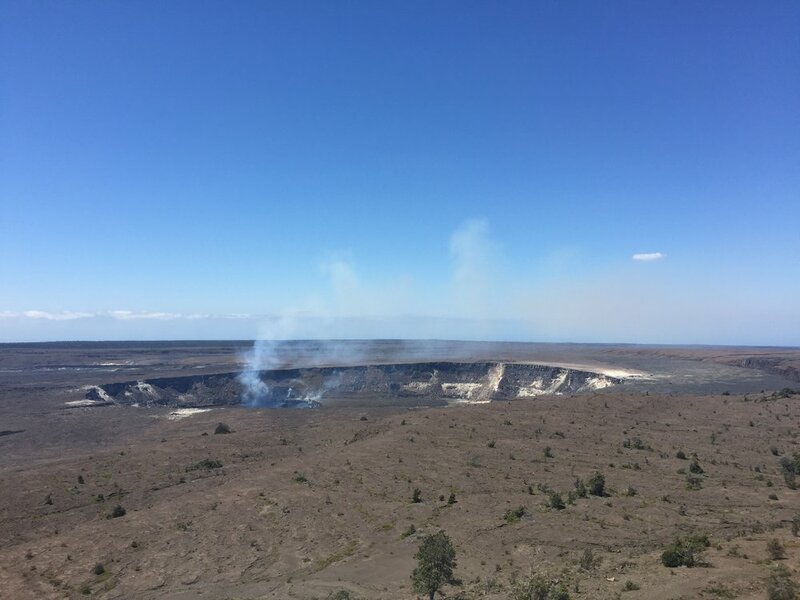 Because Kilauea is continuously erupting, you could see smoke escaping the crater. Sometimes at night you can see the glowing orange of the lava. Simultaneously the lobby TV cycled through the various eruptions of Kilauea over the years, some amazing images, making this incredible view feel a little too close. Next we took a drive on Chain of Craters Road. This experience is not to be missed. There are 10 main stops on the journey but endless changes in landscape and breathtaking scenery. Our first stop, Pauahi Crater, left us mesmerized by the size and deep color. It was interesting leaving the site as we both realized we had the same reaction. We visited the Grand Canyon a few years back and were wondering how this crater made such an impact on us when its size could not even compare to the Grand Canyon. We came up with the conclusion that the Grand Canyon is so large, it’s almost incomprehensible whereas this crater is a very clearly defined, simply massive hole in the earth, of which you can see the entire boundary. Chain of Craters Road also includes lava tubes (which we at first had no idea what they were). It turns out that they are pretty incredible. Docile and cave-looking now, the lava tube is a natural tunnel formed by flowing lava which is moving under the surface. What now remains is large enough to walk through. It was a little spooky at first (maybe because the structural lighting was broken when we visited), but incredible to imagine what that very area looked like when active. Chain of Craters Road has changed frequently due to the ever vivacious and mood changing surrounding volcanoes. We would drive past a green pasture and then come across a dividing black line of lava flow. You could look up and down the mountain and see evidence of the flow's life. It was also interesting to notice the variances which demonstrated the age of the flow. Some were almost turning gray from the sun and seemed brittle while the more recent flows were deep, metallic, and almost looked to still be in motion. Another remarkable stop on Chain of Craters Road is the Hōlei Sea Arch. This rather unique bridge like feature is also due to varying lava flows over many years. It’s most intriguing attribute is that it is temporary. Every year it changes slightly and eventually it will crumble into the ocean below. So go see it while you still can! Our last adventure at the park was the search for active lava. This can be a difficult and dangerous journey, so it is important to be prepared. Because the volcanic area is so vast, there are several entry points, all requiring miles of hiking. We chose the access point nearest to the ocean entry which we wanted to see. This access point also allowed us to rent bikes for the first couple miles of the journey, in which you can bike along the emergency access road. From there you lock your bike up and begin an uncharted hike over the lava land. We began walking, somewhat aimlessly, hoping to find an area of active lava (it's said to look silver and shimmer in the daylight). As we continued hiking, the ocean entry became more visible, large plumes of smoke billowing into the air. The lava we walked along was so interesting – some areas looked like spaghetti, while others had the typical oozing look. Some areas were sturdy, while others brittle and would buckle underneath your step. You could see the various factors at work - type of flow, temperature, speed, direction - which all left impressions on the lava molds. As we journeyed up the terrain, we began coming across steam vents, which are extremely hot (and a little nerve-racking). Once we began to know where they were however, it was exciting to see the light steam and feel the incredible heat rising up through the old lava, another reason to have vigilant eyes while hiking along the volcanoes playground. Hours passed and we were having an amazing time, although no luck in finding active lava. Night fell and suddenly the mountain side began to glow. Every day, and frankly every hour the lava flow and patterns can change – it’s impossible to know exactly where it is, and on this day we were not very close. However, seeing the mountainside light up with incandescent streams, was a sight to behold. We ending our adventure on a rock overlooking the ocean entry (which as of November 2017 is no longer flowing). Again, nightfall made this view more spectacular, as the plumes now glowed and you could see the vibrant red and orange lava fall into the sea. The journey to the Hawai’i National Volcanoes Park was overwhelming in the best way possible. You learn about volcanoes and see photographs, but to actually walk among a rich volcanic land and experience the results is remarkable. There is also something simultaneously unsettling and rather exciting to be walking along the home to four currently active volcanoes, all of which are still very much alive. We learned that 90% of the coffee served in the continental US comes from HI! *Free tasting with tour, and a great gift shop!